Vancouver Province photo Gallery capturing the painstaking restoration of wooden boats at Richmond’s Commodore’s Boats. The Vancouver Province contacted Commodore’s Boats and asked if they could take some photos and create a news documentary featuring the shipwrights at Commodore’s plying their craft in the restoration of a historic wooden boat. How to restore a wooden boat? 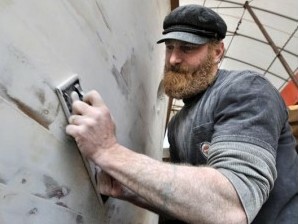 Shipwrights Dwight Laven and Bo Spiller were photographed and video taped as they ran through a short demonstration on the painstaking work involved in the restoration of a vintage wooden boat. The shipwrights were photographed as they put a piece of lumber into a steam box and showed them as they bent a steamed plank. The shipwrights than were photographed using a 1905 vintage 36 inch ship saw to shape a raw piece of lumber into a workable plank for use on the classic wooden monk. The feature documentary finished up as Bo Spiller pounds cotton caulking between planks of the wooden wood hull and Dwight Laven sanding the hull. The documentary designed to educate the public as to the traditional ship repair methods that are still utilized in the restoration of wooden boats.